In 2016, there were 189 road deaths among cyclists in the Netherlands. This is approximately 30% of the total number of road deaths. The number of seriously injured cyclists is not exactly known. 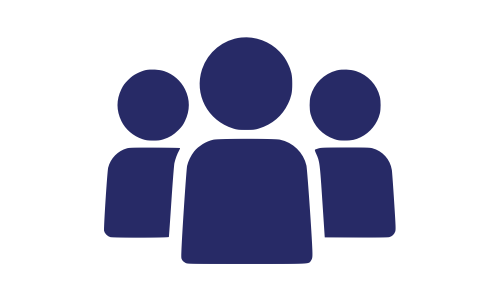 Their number in 2015 was estimated to be more than 60% of the total number of serious road injuries, which would be over 13 thousand. A large proportion of the seriously injured cyclists is the result of a single bicycle crash, a crash in which no other road user is directly involved. Whereas over the past few years road safety has improved for most modes of transport, this has not been the case for cyclists . Unsafe behaviour by cyclists themselves can increase their risk. Risk factors are cycling through the red light, smartphone use, cycling under the influence, and cycling without good bicycle lights. Unsafe behaviour of other road users – speeding, distraction, driving through the red light, drink-driving – is also dangerous for cyclists. Further improvements to the infrastructure (e.g. separate and sufficiently wide bike paths) and new ICT applications, both for the bike itself as well as for cars and the traffic system in general can improve the safety of cyclists. More information about cyclist safety and possible measures can be found in the (archived) SWOV Fact sheets Blind spot crashes, Bicycle helmets, Phone use by cyclists and pedestrians, Senior cyclists, What are the risks of cycling during darkness?, Crossing facilities for cyclists and pedestrians en Bicycle facilities on distributor roads. The most important information in these fact sheets has been included in the present fact sheet. How many road casualties are there among cyclists? In 2016, there were 189 road deaths among cyclists in the Netherlands. This is approximately 30% of the total number of road deaths (see SWOV Fact sheet Road deaths in the Netherlands). This data refers to all casualties registered as cyclists, and therefore includes riders of pedelecs, racing bikes, speed pedelecs, cargo bikes, etc. In the past ten years, the number of road deaths among cyclists did not change much, whereas the number of road deaths decreased in most modes of transport during that period. The number of road deaths among car occupants, for instance, showed an average decrease of just over 6% a year during the period 2006-2015  (see Figure 1). Figure 1. 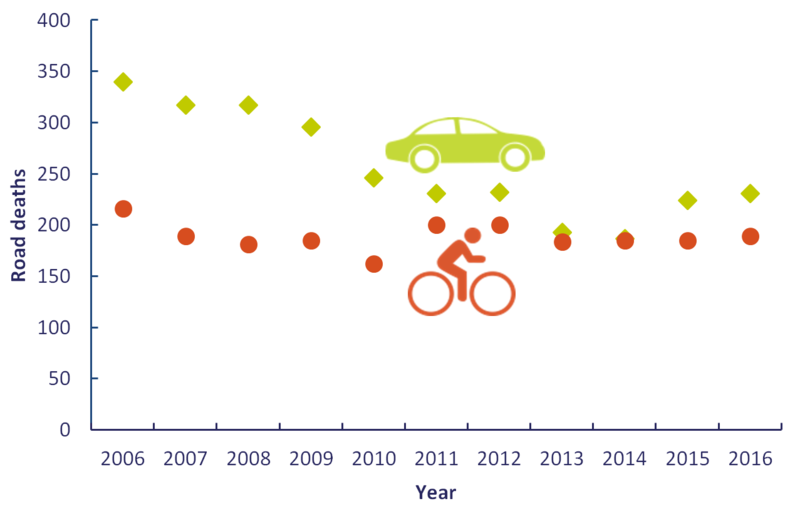 Development of numbers of road deaths among cyclists and car occupants (; Source: CBS – StatLine ). There is no exact data on the number of seriously injured cyclists. It is estimated that in 2015 they were responsible for 63% of the total number of serious road injuries . This would correspond to over 13 thousand seriously injured cyclists. Over the past decade, the number of seriously injured cyclists has been growing proportionally. In 2006, 51% of the serious road injuries were cyclists; in 2015 the proportion had risen to 63% . Is cycling safer or unsafer than other modes of transport? Cycling is less safe than travel by car, but safer than travel by (light) moped, including the scooter-type models, or by motorcycle. Expressed in the number of road deaths per kilometre, the risk of a fatal road crash is seven times higher for cyclists than for car occupants, but four times lower than for (light-)moped riders or motorcyclists. During the past decade the fatality rate for cyclists barely went down (-1.8%), whereas that of other modes of transport did decline: the fatality rate of car occupants dropped by more than 6%, that of (light-)moped riders and of pedestrians both declined by almost 5% . Where and how do most casualties among cyclists occur? In 2015, about 70% of the road deaths among cyclists were the result of a collision with a passenger car, van, truck or bus. Over 80% of the serious road injuries among cyclists occurred in crashes in which no motor vehicle was involved . The past thirty years (1996-2014)  show a similar picture (see Figure 2). In this period, 53% of road deaths among cyclists occurred in crashes with a car or delivery truck, 17% in a collision with heavy traffic, 2.3% in a collision with a train or tram, 3.6% in a collision with a powered two wheeler and 24% in crashes in which no motor vehicle was involved. This last group were usually crashes in which no other road user was involved, no cyclist or pedestrian either. These so-called single-bicycle crashes (the two blue slices in Figure 2) were mainly falls without a crash opponent and sometimes a collision with a solid object. Figure 2. Distribution of road deaths among cyclists by crash opponent (if known) in the period 1996-2014 . During the period 2000-2009, approximately 49,000 cyclists per year received treatment in the hospital emergency department (A&E) as a result of a single-bicycle crash; these are almost 70% of all A&E-injured cyclists. The number of cyclists seriously injured in single-bicycle crashes is unknown . 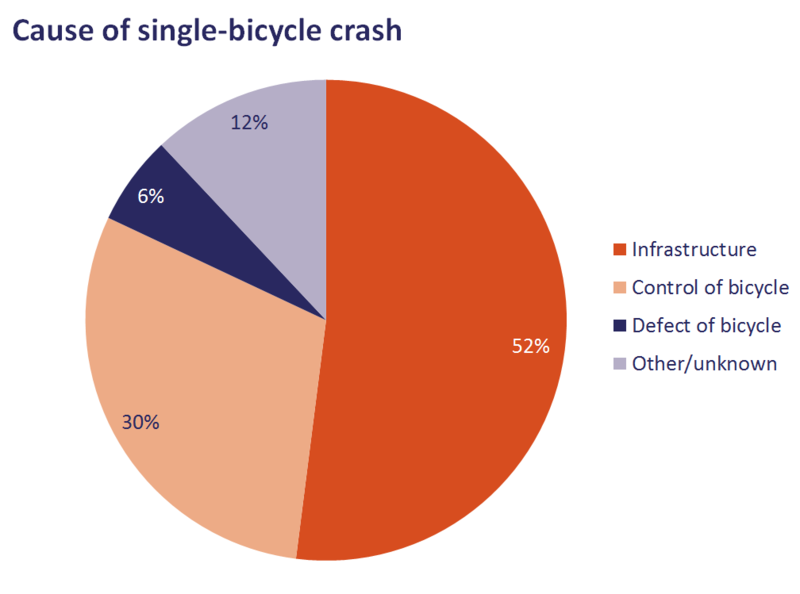 Schepers & Klein Wolt  found that the majority (52%) of single-bicycle crashes were related with (shortcomings of) infrastructure, and about a third (30%) with loss of control of the bicycle (Figure 3). This data has become available from a questionnaire study that was held among cyclists who received A&E treatment in the spring of 2008. Figure 3. Causes of single-bicycle crashes after which the riders received A&E treatment . Three in five (60%) road deaths among cyclists occur in urban areas, usually at intersections. In urban areas, 65% of the road deaths among cyclists bicycle occur at intersections, in rural areas the proportion is 52% (2000-2009 data) . During the period 2000-2009, 81% of the crashes between cyclists and motor vehicles in which the cyclist was seriously injured occurred in urban areas and nearly three quarters of these were at intersections . Information about the location of bicycle crashes not involving of a motor vehicle is not available. What do we know about blind spot crashes? During the period 2005-2013, an average of nine road deaths per year occurred in so-called blind spot crashes. Most blind spot crashes happen at intersections in urban areas when the truck/delivery vehicle wants to turn right from standstill and a cyclist who is positioned at the side or just in front of the truck wants to drive straight ahead. This mainly occurs at intersections with traffic lights that turn green for cyclists and other traffic simultaneously. The cyclist has right of way, but the truck driver fails to notice him or her . More information, among others about measures to reduce the number of blind spot crashes, can be found in the (archived) SWOV Fact sheet Blind spot crashes. Which groups of cyclists have the highest numbers of casualties? Especially elderly people are involved in bicycle crashes. Nearly three quarters (73%) of the road deaths among cyclists and nearly half (46%) of the hospital registered seriously injured cyclists are 60 years of age and older. This is mainly because these cyclists are physically very vulnerable. See also the archived fact sheet Senior cyclists. 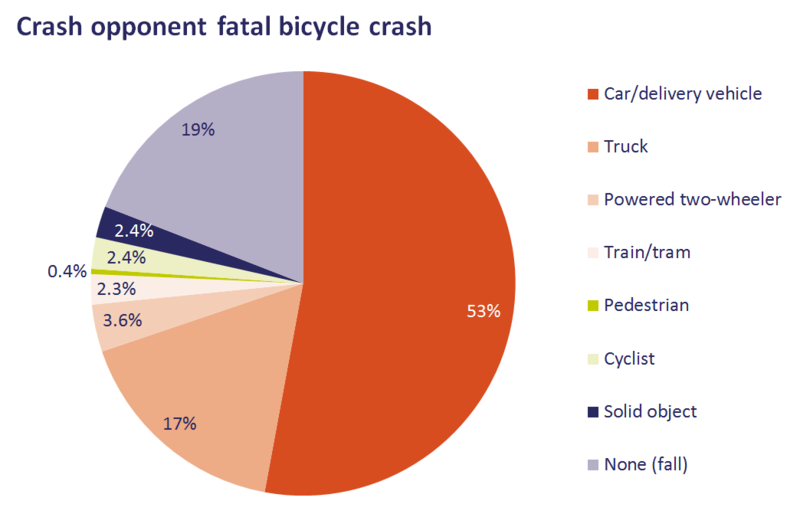 What are the main causes of cycling crashes? Mostly it is a combination of several factors which leads to a road crash. In the occurrence of a bicycle crash factors related to infrastructure, vehicle and behaviour play a role. Often there is also a combination of unsafe behaviour of the cyclist and unsafe behaviour of another road user. Both the quality and the general layout of the infrastructure play a role in the occurrence and outcome of bicycle crashes. A poor quality of the road surface (e.g. pits, trenches, drain covers, embankments by tree) is often the reason for a single-bicycle crash  . Pits and bumps, for instance, play a role in 6% of the single-bicycle crashes . Nearly one third of the single-bicycle crashes involving race cyclists occur on a (very) slippery road surface and when there are lengthwise trenches. The proportions for mountain bikes and hybrid bikes are 13 and 16% respectively . good crossing facilities at locations where cyclists need to cross the car network. The extent to which the vehicle – in this case the bicycle – has played a role in causing the crash is difficult to establish and is also not systematically registered. However, it is clear that when riding a bicycle there is always a risk of falling, because it is a vehicle requiring balance that is inherently unstable  . The bicycle type may also influence safety; different bicycle types have different riding positions, ease with which one can put the feet on the ground, and ease with which one mounts and dismounts . One also slips sooner on a bicycle with narrow tyres than on a bicycle with wide tyres. A safe bicycle has a sound frame construction, good brakes and lighting, and well-profiled tyres . Senior cyclists(65 and older) often have a different way of mounting, starting and dismounting, which makes it harder to maintain one’s balance  . They could benefit from specially designed tricycles that can prevent a fall when mounting and dismounting   . Unsafe traffic behaviour of other road users, e.g. speeding, distraction, red light running, driving under the influence, increases the risk of crashes, in particular also the risk of crashes with cyclists . Also the unsafe behaviour of cyclists themselves, e.g. smartphone use, cycling under the influence, cycling without good bike ligths, increases the risk of a crash. Often there is also a combination of the above unsafe behaviour by both cyclist and fellow-road user. Are speed pedelecs and pedelecs more dangerous than regular bicycles? Speed-pedelecs are bicycles with a powerful electric engine that offers pedal assistance up to 45 km/hour and for which helmet use is compulsory. There is still insufficient information to be able to comment on the risk of speed-pedelecs. In relation with the transfer of the speed-pedelec from the bike path to the roadway per 1 January 2017 (from that date the speed-pedelec falls into the category moped), the Minister of Infrastructure and the Environment has requested SWOV to carry out a study into the behaviour of speed- pedelec riders . The results of this study are expected late 2017. Also, for the 'regular' pedelec (pedal assistance up to about 25 km/h), it is not exactly known whether the risk is higher than for a regular bike. The injury severity, however, is greater in crashes with a pedelec . For more information see SWOV Fact sheet Pedelecs and speed pedelecs. Is race cycling on public roads more dangerous than regular cycling? It is unknown if race cycling on public roads is more dangerous than regular cycling. This is due to the fact that casualties among race and tour cyclists are not registered as a separate category in the crash register BRON. Nor is there information about the annual distance travelled of this group. The injury Information system LIS that is based on hospital data, on the other hand, does contain information about race and tour cyclists . This data shows that the number of casualties among race and tour cyclists has increased strongly in recent years: from around 2,000 A&E treatments per year in the period 2007-2010, to 4,200 A&E treatments in 2012 and 3,800 treatments in 2013. A specific risk concerns cycling in groups. Nearly 70% of the crashes involving racing and touring cyclists occur while they cycle in groups. If a racing or touring cyclist crashes, it is a due to a collision with a fellow-cyclist in almost half the cases . With their advice in the Safety Handbook for Cycling  the Netherlands Tour Cycle Association NTFU tries to improve cyclist safety. How dangerous is the combination of bicycles, light mopeds and pedelecs on a bicycle path? Based on theory it is to be expected that the bicycle path will be more unsafe when there are more users and at greater differences in speed and mass between users of the bicycle path (regular bikes, racing bikes, cargo bikes, pedelecs, light mopeds, scooters). Observations during the morning rush hour on eight locations in the Hague and Amsterdam, however, found no direct link between numbers of users and their behaviour on the bicycle path and objective safety . The diversity was found to be limited: more than 90% of the bicycle path users had a regular bike. However. Light mopeds ( especially the scooter-type models) are wider and due to the difference in speed, more frequently overtook other users of the bike path. Per neighbourhood or region the conditions can be different. Amsterdam, for example, has relatively narrow bicycle paths and a relatively high proportion of light mopeds and scooter-type light mopeds on bicycle paths. Based on a number of assumptions SWOV has estimated that Amsterdam traffic will be safer if it is made mandatory for light-moped riders – wearing a helmet – to use the roadway . For the most part this will be due to the expected shift in mobility: mandatory helmet use will be reason for many to exchange the light moped for a safer mode of transport (public transport or car). How dangerous is cycling under the influence of alcohol? For cyclists the risk of a crash increases as their blood alcohol content (BAC) increases. For example, the risk of being injured in a crash is almost sixty times higher for a cyclist with a BAC of more than 2 g/l (0.2 Promille) than for a sober cyclist (Olkkonen & Honkanen, 1990, cited in . Cyclists in the Netherlands have the same legal alcohol limit of 0.5 g/l (0.5 Promille) as car drivers. The number of young cyclists (15-29 years) who are admitted to hospital on weekend nights after a crash not involving a motor vehicle has been rising for several decades; in 2014 was half of them had used alcohol . On popular nights out in November 2013, an average of 42% of the tested cyclists in the entertainment area were found to be over the legal limit for alcohol (BAC > 0,5 g/l). These alcohol tests were held among cyclists in the city centre of the Hague and Groningen on Thursday and Saturday nights (17:00-08:00 hours). The percentage of cyclists under the influence increased as the evening progressed: at the beginning of the evening none of the cyclists had a BAG above the legal limit, after one o’clock at night 68% of the cyclists had a BAC above the 0.5 g/l and after five o’clock in the morning this applied to more than 80% of the tested cyclists . How dangerous is red light negation by cyclists? In the period 1993-2009, the Netherlands counted an annual average of 8 road deaths and 68 serious road injuries (MAIS2+) per year among cyclists who ignored the red traffic light . We do not know of any research that has investigated the extent to which the risk of a crash (crash rate) increases when a cyclist ignores the red light. However, the risk increase is very plausible; the number of possible conflicts with other road users also increases if one ignores a red traffic light. An Australian study into the risk of red light negation by pedestrians  confirms this: the risk of a crash was eight times higher when a pedestrian crossed at a red light than when he/she crossed at a green light. How dangerous is smartphone use while cycling? It is plausible that distraction due to the use of a smartphone while cycling increases the risk of a crash. When cyclists look at the phone screen, they do not have their eyes on the road and when they use ear- or headphones to listen to music, they cannot hear other traffic approach. Phone use can also result in cyclists being distracted from traffic around them. It is unclear how compensatory behaviour (such as cycling at lower speeds) decreases this risk in turn. Ultimately, it is hard to say to which extent smartphone use affects crash risk of cyclists, because no recent data are available: there is no (adequate) registration nor is there recent research. Two older Dutch studies indicated that phone use preceded and possibly played a part in 3 to 4% of the bicycle crashes with ‘some injury’  . An analysis of device use in general (including listening to music) estimated a maximum of 9% of bicycle crashes with ‘some injury’ where device use possibly played a role. This percentage was higher for the age group 12-34 years: 17-18%. It is uncertain to which extent these percentages are still valid. Measurements in The Hague showed that about 20% of the light-moped riders and cyclists is occupied with his or her smartphone . Measurements in ten different cities in the Netherlands showed that of all 7707 cyclists who participated in the study 24% used devices; 17% listened to music, 4% operated a screen and 3% talked on the phone . De Waard et al. found that Dutch cyclists increasingly use the smartphone for texting instead of phone calls. This is an undesirable development because typing text messages has the strongest effect on cycling behaviour    . For more information see SWOV Fact sheet Phone use by cyclists and pedestrians. How dangerous is cycling in the dark without adequate bicycle lights? Estimates based on registered injury crashes in the period 2002-2010 indicate that bicycle lighting is effective. A regression analysis shows that the risk for cyclists of being involved in a crash during darkness decreases by about 17% with working front and rear light. The researchers, however, find the uncertainty in the outcome too large for a reliable estimate of the size of the effect. Also, the quality of the bike lights has not been taken into account (results therefore relate to such bike lights as were customary in those years . We do know, however, that the risk of a crash is greater for cycling in the dark than for cycling during daylight  . If one corrects for the distance travelled, then it turns out that the risk of being a seriously injured in a bicycle crash is highest in the dark during the early hours of the morning (after midnight and until the morning dusk). In addition to poorer visibility, alcohol use also adds to the greater risk of cycling in the dark. See also the archived SWOV Fact sheet What are the risks of cycling during darkness? In the winter of 2012/2013, an average of 61% of the cyclists used front and rear lights during the morning rush hour and in the early evening . In the summer of 2015, the average was 41% in entertainment areas and during nightlife hours . Because of differences in the study designs (observation times, locations), the results are not comparable. Therefore the differences do not give any indication about possible developments over time. Is priority for cyclists on roundabouts safer or less safe for cyclists? Roundabouts without priority for cyclists are safer for cyclists than roundabouts with priority for cyclists, also in urban areas. CROW , the technology platform for transport, infrastructure and public space, recommends no priority for cyclists on roundabouts with separate bicycle paths in rural areas and priority on urban roundabouts. This guideline is the result of a comparative assessment between road safety on the one hand and comfort and flow of cyclists on the other hand. Dijkstra  shows that the arrangement with priority for cyclists is less safe and gives two possible explanations. First, drivers would wrongly believe to have priority over the bicycle, perhaps being confused by the lack of uniformity [i] in priority regulations on roundabouts. Second, drivers on a roundabout need to perform (too) many observations in a short period of time, consequently noticing a cyclist too late. For more information see SWOV Fact sheet Roundabouts. [i] On approximately 60% of the roundabouts with separate bike paths in urban areas the cyclist has right of way. In most cases, the priority situation on the various roundabouts within a municipality is the same. The uniformity at this point, however, is missing in the Netherlands. In terms of predictability this is not desirable . How effective is a bicycle helmet? A bicycle helmet decreases the risk of severe head injury by 60% and the risk of fatal head injury by 71%. This was the conclusion of the meta-analysis of Høye , which included 55 case-controlstudies [i] and compared the injuries of bicycle casualties who did or did not wear a bicycle helmet. However, the protective effect of the helmet gradually declines to a lesser extent as the impact speed exceeds the 20 km/h to a greater extent. For more information see SWOV Fact sheet Bicycle helmets. [i] With the exeption of a few studies that used a prospective cohort study design. Is helmet use mandatory on pedelecs or speed pedelecs? The Netherlands has no mandatory helmet use for pedelecs (pedal assistance up to 25 km/h), because this is considered a 'regular' bike. Since 1 January 2017, helmet use is mandatory for speed pedelecs (pedal assistance up to 45 km/h) as European legislation categorises speed-pedelecs as mopeds starting from 2017. Before 2017, they were categorised as light mopeds. The helmet for speed pedelecs can be a regular moped helmet that meets the ECE 22.05 standard, or a helmet that meets the NTA8776:2016 standard that was developed specifically for the speed pedelec. What measures have been taken to improve bicycle safety? In the framework of the Policy Stimulus Road Safety  ‘Local approach to safe cycling’ has also been used in recent years. This approach aims to encourage municipalities and help to structurally embed bicycle safety in the municipal policy. To this end, a brochure Model Approach to Safe Cycling (a helping hand for creating or strengthening a local approach to safe cycling was made in 2012. A webtool Approach to safe cycling was also developed. The Ontwerpwijzer fietsverkeer  (Design guide for bicycle traffic) was developed for cycling infrastructure. CycleRAP is a recently developed instrument to map out the quality of the cycling infrastructure. Based on Cyclomedia-images it rates every 25 meter of a road or bicycle route on features that are important for bicycle safety. This instrument is applied and validated in the municipality of Amsterdam . See also the (archived) SWOV Fact sheets Bicycle facilities on distributor roads; Crossing facilities for cyclists and pedestrians; Principles for safe road design. Which general measures can contribute to more bicycle safety? The cycling infrastructure can be further improved by the construction of bicycle routes and separate bike paths. Important aspects of this are the separation of heavy/fast traffic and cyclists, the safer design of 30-and 50 km/h-roads, removing bicycle bollards, making the bicycle routes recognizable, forgiving and obstacle-free and sprinkling these first when roads become icy  . A different type of bicycle, e.g. a tricycle or a bicycle that allows putting both legs on the ground when standing still, can prevent falling, especially for older cyclists . Cyclists can invest in their own safety by keeping to the traffic rules, by not being distracted, by increased visibility, by using a bicycle helmet, and by choosing routes through residential areas or along roads with separate bicycle facilities as much as possible . Intelligent Transport systems (ITS) can also contribute to the safety of cyclists. For example, Intelligent Speed Assistance (ISA) will often prevent drivers from speeding in 30 km/hour-areas. Night vision systems for cars can improve night vision and hence facilitate (more) timely perception of cyclists . Further development of bicycle education activities and police enforcement could improve bicycle safety. The Netherlands has various traffic education programmes for different groups of cyclists (primary school pupils, secondary education, elderly). These programmes often focus on improving knowledge and skills. In addition, it makes sense to let bicycle education also focus on what are known as the higher order skills such as hazard perception (see also SWOV Fact sheet Training hazard perception skills concerning car drivers). 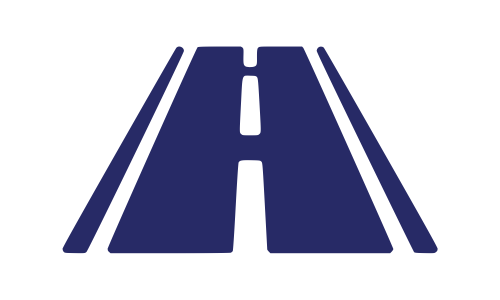 Hazard perception trainings for cyclists are, for example, being developed in Finland and Belgium  . Police enforcement of unsafe cycling behaviour could for instance be targeted at bicycle lighting and red light negation. For more information see SWOV Factsheets: Traffic education en Police traffic enforcement. Which new technologies for bicycle and cyclist can contribute to road safety improvement? The bicycle itself could be constructed as an "intelligent" vehicle. In the Netherlands a prototype has been developed of the Smart Supporting bicycle, the SOfiets. This bicycle automatically adjusts the saddle height to the cycling situation, making it possible to put both feet on the ground when stopped and cycling at low speeds and to cycle comfortably with stretched knees at higher speeds. The bike also has a low-entry level frame and electrical support when one starts cycling. In 2016, TNO developed a prototype of an ‘intelligent’ bicycle, which warns of obstacles and traffic behind the cyclist. Figure 4 shows the innovations of both types of intelligent bicycles in one figure. In addition, Delft University of Technology and Gazelle together work on a self-stabilizing bicycle that makes adjustments if the bicycle tilts and should prevent the cyclist from falling. A route planner that optimizes cyclist safety (Routeplanner Gent). The European project SAFECYCLE has analysed these technologies, and the above-mentioned five technologies for bicycle and cyclist. Figure 5 shows the estimated effects of these technologies on the crash risk (horizontal axis) and injury severity (vertical axis). The higher the score, the more positive the effect. The size of the circles indicates the relative cost-benefit ratio (the bigger the circle, the more favourable the cost-benefit ratio). Figure 5. Results cost-benefit analysis of twelve used applications . X-as: effect on the risk of a crash. Y-as: effect on injury severity (impact). 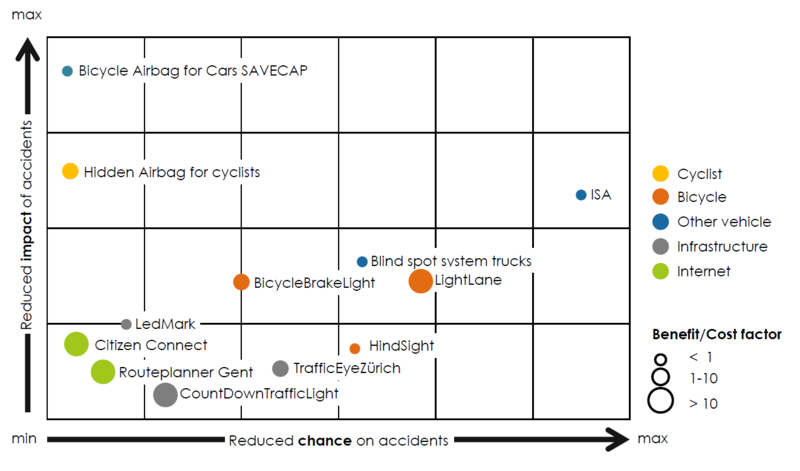 Which technologies that focus on cars can contribute to improved cyclist safety? An automated blind spot system for trucks (Lexguard; see Figure 5 ). There is also a system that automatically makes an emergency stop at critical interaction with a pedestrian or cyclist (Autonomous Emergency Braking - AEB). From 2016, a car must have an AEB for pedestrians to get the maximum Euro NCAP-score; an AEB for cyclists should become part of the Euro NCAP rating of passenger cars starting from 2018. Coordinated by TNO, a test protocol for this new technology was drawn up in 2016 . Hagenzieker , Vissers et al. en Twisk et al. warn that ‘intelligent’ vehicles may behave differently than cyclists (or pedestrians) expect, which can cause unsafe situations to occur. Also electric cars, that are very silent at low speeds, can cause safety problems for cyclists. Further research will be needed to provide answers to these types of new safety issues. Below you will find the list of references that have been used in this fact sheet. 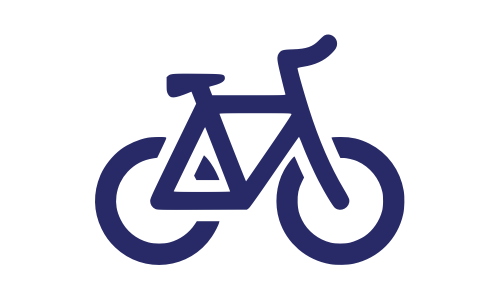 In our Library Portal you can find more information about this topic in the theme file “Bicycle safety Netherlands”.
. Wegman, F. & Aarts, L. (2006). Advancing Sustainable Safety; National Road Safety Outlook for 2005-2020. SWOV, Leidschendam. SWOV (2017). Cyclists. SWOV Fact sheet, June 2017. SWOV, The Hague.